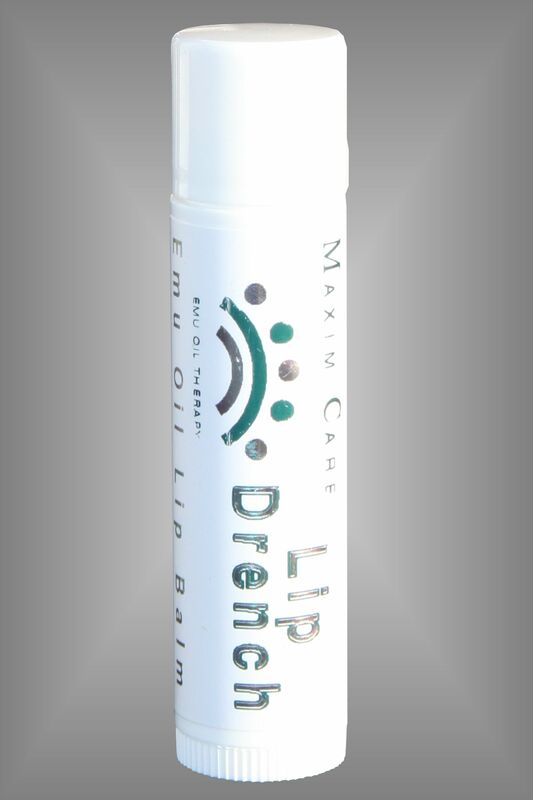 Maxim Care All - Natural Lip Drench has combined 50 % Emu Oil infused with nature's finest healing herbs for dry, chapped and irritated skin. These healing herbs are: calendula, chamomile, comfrey leaves, and St. Johns Wort. It also contains beeswax, jojoba oil, Shea butter, Vitamin E, honey, Tea Tree Oil, and spearmint oil for a refreshing scent. The combination of these all natural ingredients provide your lips with the best protection and healing possible. This all natural Lip Drench works extremely well on chapped lips and cold sores. Regular use can prevent cold sores. This all natural lip drench goes on smooth and can be worn alone or under lipstick. It soaks into the deeper layers of the skin on your lips healing both the top layer and lower layers of your delicate lip skin. You will actually feel the difference as your lips are being nourished! Directions: Apply liberally to lips as often as needed. For maximum results, use daily to keep lips nourished and hydrated.....naturally! Ingredients: 50 % Emu Oil, infused with Calendula, Comfrey leaves, Chamomile, St. Johns Wort, Beeswax, Jojoba oil, Shea butter, Vitamin E, Honey, Tea Tree Oil, and Spearmint Oil.